27 December 2016, at 6:00a.m. With the United States producing almost half the world’s turkey meat, Glenneis Kriel talked to Joel Brandenberger, president of the National Turkey Federation in the US, to find out the latest trends affecting American turkey production. 2015’s highly pathogenic avian influenza outbreak in the US had a significant impact on the region’s turkey industry. Even so, it’s not a disease, but consumers that are the “biggest thorn in the flesh” of the American turkey industry. Most consumers are however unaware of this. “The disassociation between consumers and the way in which turkeys are produced and processed, has created the opportunity for animal rights activists to influence and confuse consumers. “This in turn is having an impact on individual purchasing habits as well as governmental policy,” Brandenberger said. The industry welcomed this new interest in how food is raised by showing off its production abilities. Among these outreach methods is a video tour of a turkey farm and processing plant presented by the animal welfare expert Dr Temple Grandin. In the video, Dr Grandin addresses various consumer concerns and misconceptions about production by interacting with a flock of 1500 birds roaming freely down the football-field length of a climate controlled turkey house. When readied for market, the turkeys – without any stress – ride up into a conveyor loading trucks and to an orderly delivery at the processing plant. The process is seems as natural as consumers riding escalators in a shopping mall. In the processing plant, the birds are humanely stunned to render them unconscious, before they are processed under the watchful eye of government inspectors enforcing safe and sanitary preparation. The industry has also demonstrated the smaller environmental footprint of the enclosed protective turkey barns and the way in which recycled wood shaving on the barn floors could be recycled as a valuable nutrient rich fertiliser. Mr Brandenberger said that the industry aims to address consumer concern through continuous innovation with technology and management practices to provide more efficient handling of birds from the farm to processing plant. In support of farmers’ efforts, a National Antimicrobial Resistance Monitoring System report of the Food and Drug Administration released earlier this year, showed that the prevalence of Salmonella in poultry sold at retail was at its lowest level since Food and Drug Administration testing began fourteen years ago. In ground turkey the prevalence of Salmonella has declined from a peak of 19 per cent in 2008 to 6 per cent in 2014. The report found no resistance from poultry or beef to critically important fluoroquinolones, like ciprofloxacin. Salmonella resistance to the antibiotic ceftriaxone, an important antibiotic used to treat seriously ill patients, has also declined in turkeys from 7 per cent in 2014 isolates to 4 per cent in 2015 isolates. This represents an 80 per cent decline since 2011 when resistance was at its peak at 22 per cent. Multidrug resistance in Salmonella in turkey and chicken also continued to fall – from 45 per cent and 50 per cent respectively, to 20 per cent and 36 per cent in June 2015. 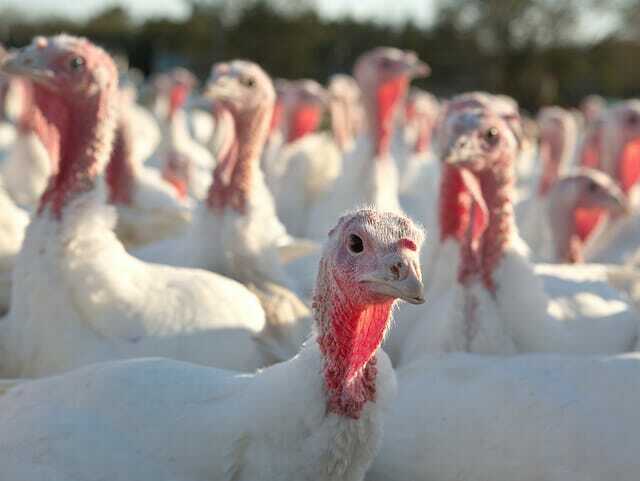 Mr Brandenberger does not see climate change as a major threat to the American turkey industry, because modern production systems shields turkeys from almost all weather-related concerns. Efficiencies in the US also include very competitive energy costs, so that it is unlikely that production would shift to countries with more favourable climatic conditions for turkey production. The incorporation of biofuels as an important fuel source of the United States, has however had a considerable impact on the turkey feed prices. “Almost half of corn is diverted to ethanol as a result of government setting a mixture of corn ethanol required to be formulated into gasoline, causing a significant volatility in pricing and availability of feed. It was especially so in years like 2012, when the US suffered a major drought,” Mr Brandenberger said. He added that Government requirement was set at different levels each year, and in recent years, the government agency failed to meet its deadline to publish the mixing level, as well as set a different level of ethanol mix than what the agency had signalled. “This unreliability regarding a significant portion of our feed supply is disruptive for poultry and livestock producers attempting to determine what supply and costs may be for this major input in their operations,” Mr Brandenberger said. The HPAI outbreak in 2015 affected slightly more than 7 million turkeys, which is about 3.5 per cent of the total turkey population originally projected for the year. He admits that the outbreak nevertheless presented an opportunity to re-evaluate and develop new disease prevention strategies. A few specific examples of these strategies include complete change of outerwear and boots kept separate from outside to inside a barn, sealing corn and soybean feed bins, maintaining separate perimeters for outside delivery trucks and then using separate equipment to move deliveries to the inner perimeters closer to the barns, as well as additional consideration of the angle of air intake vents on barns if they are on the predominantly windward side. Mr Brandenberger said the National Turkey Federation supports the option of vaccination as one of the many tools that should be available to eradicate the virus. Vaccination would however have a trade impact, because many nations would use vaccination as a pretext to declare HPAI “endemic” in the US. “Such declarations would be based on an outdated view of vaccination. Modern vaccines have the technical ability to differentiate infected from vaccinated animals (DIVA). DIVA provides evidence to trade partners that poultry have been vaccinated and is free of the virus. Through this differentiation ability, animals would not test positive for the HPAI virus simply because they were vaccinated,” Mr Brandenberger said. This article originally appeared in the June 2016 edition of The Poultry Site Digital. To read other articles from this issue, themed around 'turkeys and processing', click here.